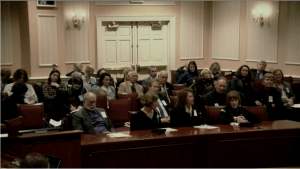 With only 10 days before a hearing in the state of MD, I was contacted and asked to testify on behalf of physicians and patients on Freedom of Choice in a new Lyme Bill 950 & 1266. As a result of my husband’s case, New York State Against Warren M. Levin, MD., not only did we win for freedom of Choice for Patients, but also the right of Physicians to provide Integrative and Functional therapies, and we had Governor Mario Cuomo sign the New York State Medical Practice Act in 1994. That was 24 years ago. Today we have 15 states that have signed Legislation recognizing the use of responsible Functional Medicine Therapies and are no longer harassing physician’s without due cause and without an expert serving on the panel. To learn more, I invite you to read/hear my testimony below as well as others who stepped forward to defend our freedoms. “NO INDIVIDUAL CAN DETERMINE THE STANDARD OF PRACTICE. And it is said: ..“before the engines of the State are started up against an individual, there must be some threshold showing of justification for such an intrusion. What I need to mention here is that one of the witnesses for Dr .Warren M. Levin, MD was Linus Pauling, PhD, two time Nobel Prize Winner in Science and Peace and the holder of 49 PhD’s. Dr. Pauling was not considered a credible witness over the opinions of the panel members, as he was not an MD. In the past two decades, legislators have taken notice of the deprivation of the rights of patients to choose their health care and the rights of physicians to choose adjunctive therapies that effectively treat their patients. New York was one of the first states to enact legislation intended to protect both the rights of patients to choose and the rights of physicians to offer “ CAM/Integrative/Functional Medicine Options. The result of this case was the passage of the New York State Medical Practice Act in the summer of 1994 ,which recognized the role of legitimate adjunctive/functional/immune rebuilding therapies and required placement two non conventional physicians on the state professional medical board to promote greater participation and understanding of adjunctive therapies. The rationale and purpose of this requirement ,in this bill, asserts and demands that at least one of the peer reviewers have training in the approach under review. It amended Education Law 6527 by adding paragraph (e) to subdivision (4) allowing physicians to utilize “whatever medical care, conventional or adjunctive therapies which effectively treats human disease, pain, injury, or other physical condition. Just as this law exists so have 15 other states amended their laws providing physicians with the right to responsibly deliver adjunctive/functional medicine therapies. The bill being presented today, Senate Bill 950, seeks to provide physicians specifically treating Lyme Disease with these same rights. Currently, however, many physicians that still practice medicine and sit on medical boards continue to protect the status quo of medicine rather than protecting consumers and the consumer’s right to informed choices. Additionally, at the same time, physicians are often prevented from providing treatment options that they consider to be responsible adjunctive therapies. After all, isn’t the role of the board to provide protection for the public as well as improve the quality of health care delivered today? The traditional medicine model is symptom centered. It concerns itself with fixing and repairing body parts which is done through surgery, drugs and other technological procedures. It is often intimidating and goes beyond the understanding of many patients. It puts the patient in the position of relying on the physician’s judgment with little consideration for the patient, their life circumstances, and their desires to participate in their care. In functional medicine, there is a patient centered approach, which means there is respect and value given to patients and their request for other therapies that might not be considered what is often called “standard of care.” This is especially important in Lyme treatment because the Lyme Spirochete and Co-Infections play havoc with so many systems of the body. Today health care requires and demands that physicians encompass the biological/physiological, psychological, social, spiritual needs of an individual. Patient(s) must be provided with comprehensive and informed consent. They must know all the options available to them so that they can discuss with their physician the best approach to their individual treatment plan. A central theme is compassion! In addition, this is a partnership that is created between the patient and their physician. This approach ensures that the complexity of chronic health conditions, as we have seen rise in this country, creates an opportunity to restore and reverse many of these conditions. Addressing Lyme Disease and its complexity allows for comprehensive evaluation and exploring the biochemical individuality of every individual under the model of a Functional Medicine Approach. Using a combination of diagnostic genetic and environmental factors, as well as identifying immune deficiencies, and then employing nutrition, diet, exercise, removal of toxins and treatment as well as prevention of further illness while providing a long term approach which allows the most optimal chance for the patient to return to a state of health and well being. This approach requires that physicians must, today, become familiar with the various and unique and complex connections of the body, mind and spirit in laying out a treatment plan. One must be a detective and work to reveal the various layers that have caused the current symptoms and deterioration of health as well as addressing the frustrations of patients who come to this point in their lives feeling that they have not been heard and their symptoms have not been addressed. Let me provide an example of a complex patient that was presented to Dr. Levin on or about 2002. A mother came to seek help from Dr Levin due to her severe level of stress dealing with a husband who was diagnosed Bi-Polar as well as her child. He was also diagnosed as Autistic. One might assume that the BI-Polar diagnosis was genetic. However, this child was adopted. Dr. Levin spent close to 2 hours doing an extensive and comprehensive history with the mother to begin to gather data and to learn about this child. The child was 7 years old, non verbal, on 4 anti psychotic drugs and in a school room with only 3 other children. He required more than one aide to be at his side at any time. He was not able to focus and roamed and had difficulty in creating any relationships as well as exhibiting temper tantrums and rages. He often grunted rather than speaking. He was still in a diaper. Dr. Levin and the mother determined what testing should be included. The various tests included among others chronic infections including the Lyme Western Blot, which was to be tested by a specialty lab as well as a National Lab, as this family resided in CT. It included various other tests including resistant Step infections which might cause or lead to a condition today known as PANS. He performed allergy testing including IGE and IGG testing. The goal was to get enough information on the bio chemistry of this child to allow Dr. Levin to determine what steps might be considered in a tentative treatment plan, knowing that alterations and adjustments would be needed based on the response of the child. While waiting for the results to come back the Mother agreed to make changes in her child’s diet. This consisted of eliminating, sugar in the form of candy and other refined carbohydrates and snacks that convert to sugar. She eliminated wheat, corn and dairy and was thus left with a diet that is often called a Paleo Diet. This consisted of meat, poultry, fish, low carbohydrate vegetables and low glycemic fruits. Within a matter of weeks the mother called the office to advise Dr Levin that there was a change in her son’s behavior at school. He was beginning to focus and pay attention to his aides and to have a sense of other children being present in the class room. Something was shifting! When the child and mother returned some weeks later to see Dr Levin, he brought with him a rubber frog which he held tightly in his fist. When he entered the office he looked at Dr. Levin and said “Here Dr. Levin. This is my rubber frog.” Everyone in that office was moved to tears and joy and a sense of hope. This was the first time that he heard this little boy speak. The results of the testing definitively confirmed the diagnosis of multiple systemic infections including Lyme, Babesia, Bartonella, Resistant Strep, multiple allergies and gut issues which all needed to be addressed. To summarize, over several months Dr. Levin worked to restore gut health, improve elimination, and ultimately began to treat this child for Lyme Disease using a combination of medications, one at a time, so that the mother, school, father and family members could observe improvement/changes in this child. This would allow Dr. Levin to further adjust the treatment plan. Ultimately, this child moved out of IEP and became fully functional and went on to be mainstreamed and attend college as an honors student. (The Mother was interviewed on KFNX in Phoenix Arizona June 6, 2004). Attached is a letter from this mother to Dr. Levin. What do I wish to leave this esteemed panel with? Scientific Truth is Not Decided by Majority Vote. Physicians have a duty and obligation not only to do no harm, but to do good, acting in the best interest of the patient. This duty should take precedence over any self interest.